Hop on over and join Paul and Donna as they learn about wonderful, springy, sproingy critters we all love, frogs! Today on the Varmints! podcast! Poing! Sometimes whimiscal wildlife photography is really animal abuse. Read PBS’s article on the topic here, courtesy of pbs.org. Colorful, non-staged red-eyed tree frog. No glue needed to appreciate its beauty. What’s the world’s smallest frog? This tiny guy! Paedophryne amauensis! Look how squee tiny he is! EEEEEEEE! Image Courtesy of Discover Magazine, article can be found here. Hi, I am Mr. Squee Tinypants Froggyman. How ya doin’. Guess what? Frogs can BREATHE THROUGH THEIR SKIN. How freaky is that? Check out this great information over at Brown University. They can also use their lungs but they are the second string oxygen delivery players. If you ever had Pac-Man Fever, you probably experienced Froggy’s Lament as well. Here is a ballad all about that drama filled little hopster. Video courtesy of YouTube user destr100. Heya Froggy baby! Introducing, Kermit theeeeeeee Frog! Video courtesy of YouTube user Sesame Street! Wanna learn about poison dart frogs? Check out this great video from Howcast and learn some great stuff about them! Video courtesy of YouTube user Howcast. Peep! Peep! Peep! Peep! Peep! Listen to the sound of the peeper frogs up in New Hampshire. Turn it up LOUD. That’s almost loud enough. Video courtesy of YouTube user Jim Butler. 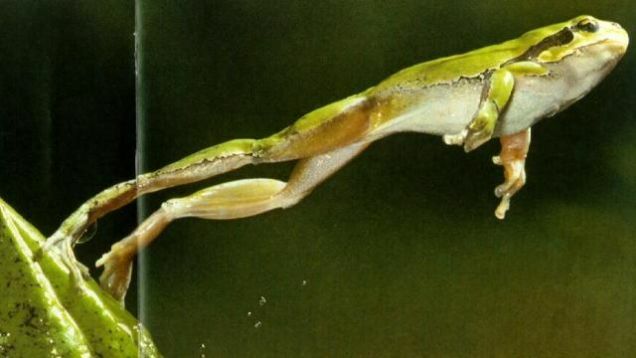 Now you know a bit more about frogs than you did this morning! What’s your opinion on them? We want to hear from you! Send us your suggestions for animals you’d like to hear us talk about, volunteer your rugrat to say something on our podcast, or just drop us a line about anything at varmintspodcast@gmail.com! We might even read your fascinating email on the show. And a very special welcome to the more than 1,198 of you that gave us a like on our Facebook page. Holy cow! Thank you! We hope you like what you hear and we look forward to hearing from you soon! Donna Hume Frogs Paul Csomo Varmints!